Concrete is without a doubt one of the most useful construction materials at our disposal. It is cost-effective, it is durable and most of all, it offers incredible variety in terms of design and application. If you’re about to do some work on your front or back garden, concrete needs to be at the very forefront of your material choices. The driveway and pathways are probably the most critical part of front garden design. They are essential both stylistically and in terms of function. Concrete is the perfect material for these elements because of all the reasons listed above. When it comes to concrete, you need to think beyond the grey, plain pour that you are accustomed to. Concrete design methods offer endless design opportunities. You can go with exposed aggregate for a textured look, or use stamping, stencilling and colouring methods to recreate any look you like, from slate to bluestone and even sandstone. The best part is, you enjoy these looks without the maintenance and cost the real materials carry. Polished concrete is all the rage right now because it looks incredible. If you’re looking up materials for a patio, outdoor kitchen or any alfresco area, polished concrete should be at the top of your list. It brings all the visual drama and class of high-end materials, like marble, while retaining all the durability, low-maintenance and affordability of concrete. All you have to do is sweep and mop the area, and it will look absolutely perfect for years. Just imagine summer night meals, afternoon drinks and family time in your new outdoor area. You’ll literally give your house a whole new room to enjoy. And, you can do it on the cheap. Terraced gardening has been used for centuries to make the most of space, and particularly sloped areas. Just look at the rice terraces in Bali, or the terraced farms in Cinque Terre to see the incredible visual effect of layered gardening. Concrete retaining walls are the easiest and cheapest way to create this effect. 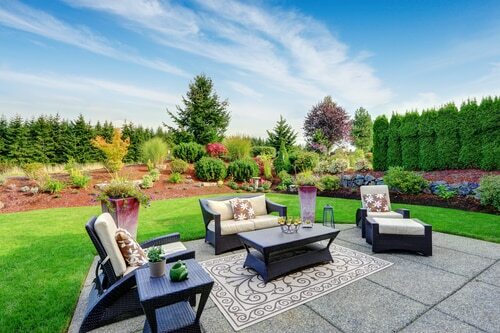 You not only increase the space in your backyard, but you can devote each level to a different aesthetic. For example, one could include flowers and trees, while the next could consist of rockeries or even a pool! The best part is, you can doctor the soil far more effectively if it’s separated from the rest of your garden, which opens up your choices regarding the flowers and plants you can enjoy. A further advantage of retaining walls is that they reduce your maintenance requirements. They hold the soil together, so you don’t have to do as much raking and mulching, and they also keep weeds to one area, instead of allowing them to spread all over your backyard. Like levels, walls also look fantastic in gardens. Creating concrete walls is cheap and easy and creates the division in your garden that makes it more interesting to look at. Walls don’t just divide, they become canvases. You can hang artwork on them, tile them, or even paint and decorate them yourself. Imagine how much fun the kids would have with a blank canvas to paint on in the backyard? However, one of the best things you can do with a concrete wall is to turn it into a green wall. A green wall is basically a concrete wall turned into a garden bed. This not only adds more greenery to your garden, but it also improves air quality and makes for a design piece that will get every guest talking. Every Garden Needs Garden Beds . . .
And the best way to build garden beds is with concrete. Other materials, mainly wooden sleepers, are prone to rot and termite infestation, meaning you have to replace them as soon as you’ve installed them. With concrete, you can literally set and forget, no maintenance required! Garden beds make gardening so much simpler, for all the reasons layered gardening is such a good idea. Everything is contained, you can doctor soil, and you can devote each bed to certain types of plants to create optimum growing conditions. Concrete can be made into almost anything, and it makes for a great DIY material. Do you need some outdoor furniture, why not pick up some moulds and pour a concrete bench or even a concrete table? Or, build a fire pit or pizza oven that will become the centrepiece of your backyard. Like anything else made of concrete, you can rely on your concrete furniture and features to last year after year.